Annan Athletic FC > Club > News Hub > General > Black and Gold all over SPFL sticker collection! Black and Gold all over SPFL sticker collection! Annan Athletic are enjoying a dazzling season, so make sure you don’t miss out on the Black and Gold’s who feature in the first ever SPFL official sticker album – on sale now! Published by Topps, the leading collectibles company and official SPFL licensee, Annan Athletic supporters of all ages will be able to get ‘stuck in’ to the all-new 2014 Scottish Professional Football League Official Sticker Collection. In a real first, the sticker album features all 42 professional clubs from the Premiership, Championship, League 1 and League 2. A 48-page album accompanies the brand new collection, which is packed with in-depth player stats, team information and all the biggest stars of the SPFL. The Topps 2014 Scottish Professional Football League Official Sticker Collection is available from supermarkets and all good local independent newsagents. Fans can kick start their collection in style with a Starter Pack (£2), which includes a 48-page album and 4 packets of stickers, giving collectors everything they need to get straight into the action! Packets of five stickers are be available for 50p each. Make sure you’re following our official twitter feed @AnnanAthleticFC for exclusive “stickers” from the 2014 collection. 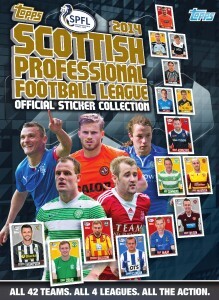 For further information about Topps Scottish Professional Football League Stickers, please visit www.toppsfootball.co.uk.